I’ll admit it. I am now an addict. Addicted to Oliver & S patterns. After stalking them online and drooling over projects on blogs like Probably Actually, Craftiness is not optional and From an Igloo, I finally broke down and bought a few patterns. My first attempt was blogged here. I was immediately a convert! These adorable patterns paired with my recent fabric purchases from Purl Soho (couldn’t go to NYC and not stop in at Purl!) 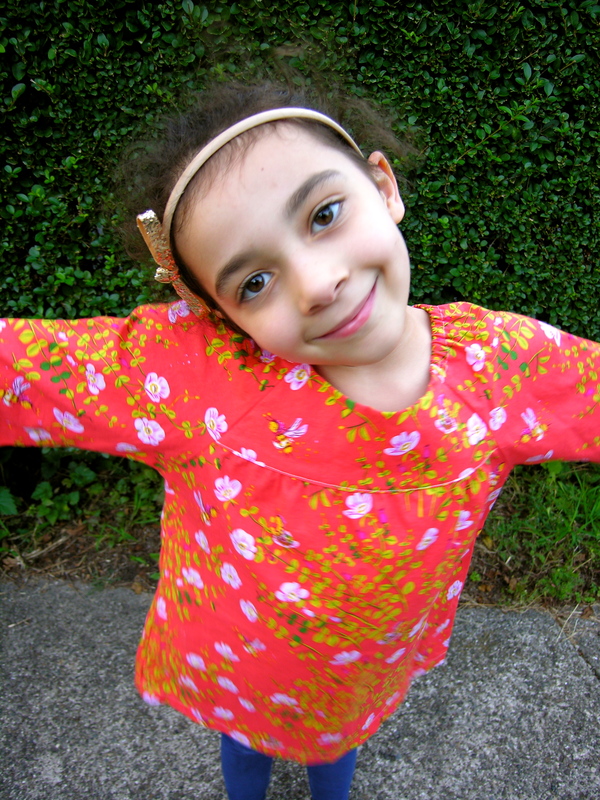 are making some ridiculously sweet new clothes for my girls as they get ready to head back to school. 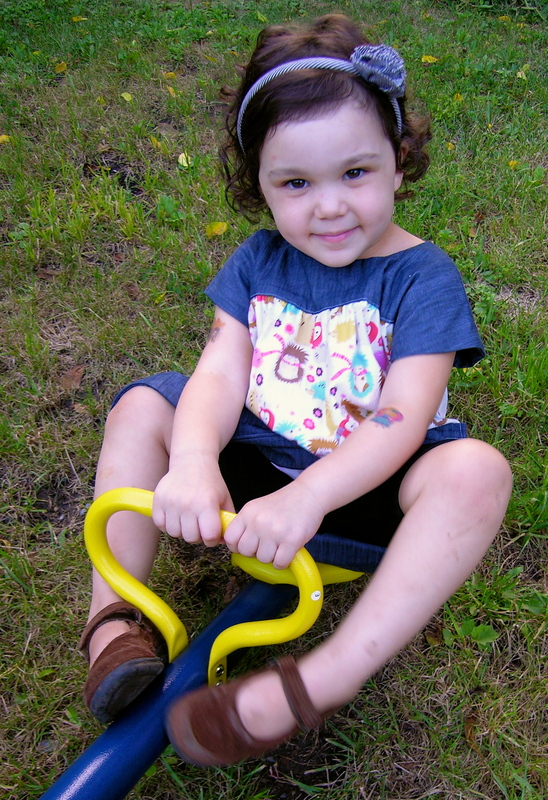 I whipped up a few new tops for Isabel and am planning out a bunch for Eleanor as well…if I can wrap my brain around the fact that she is going to school as well. My baby!! 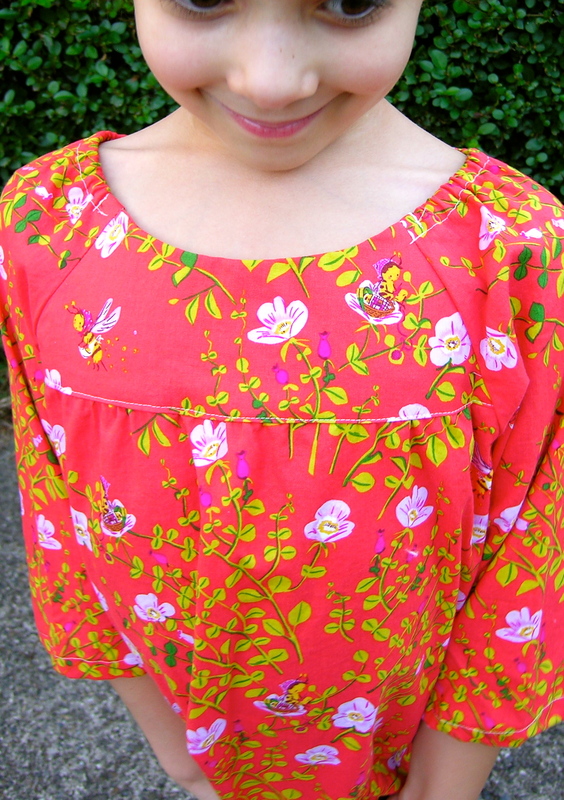 The first top is a Class Picnic Blouse, for Isabel in a size 7. I had to pick up some of Heather Ross’s Briar Rose. I have been seeing it allover the blogosphere these days, particularly the strawberry print. I went a different route and chose a print I had never seen before but fell in love instantly- Nanny Bee in Coral. Knitting bees- come on. How could I resist? So sweet. I am hoping the deep coral/orange fabric will help carry this into fall, and the longer sleeves will help keep her warmer as well. 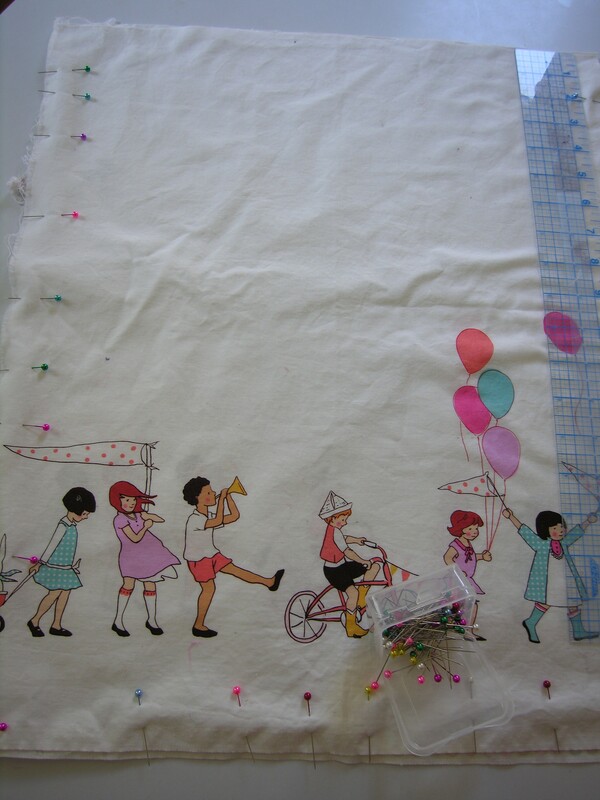 Nothing worse than sewing something up and having the weather turn…which it does pretty quickly around here. It always seems to go from 80 degrees to frost before you know it! I love this take on the classic peasant blouse, I have made more than my fair share of peasant blouses, but this is much more professional and clean with only elastic at the shoulders. I love how it looks, and it is so easy to take on and off for her as well. I think next time I will add some ric rac or piping to the seam at the yoke, and make it in a solid color for a good go with anything top. For Eleanor I made her an Ice cream dress! 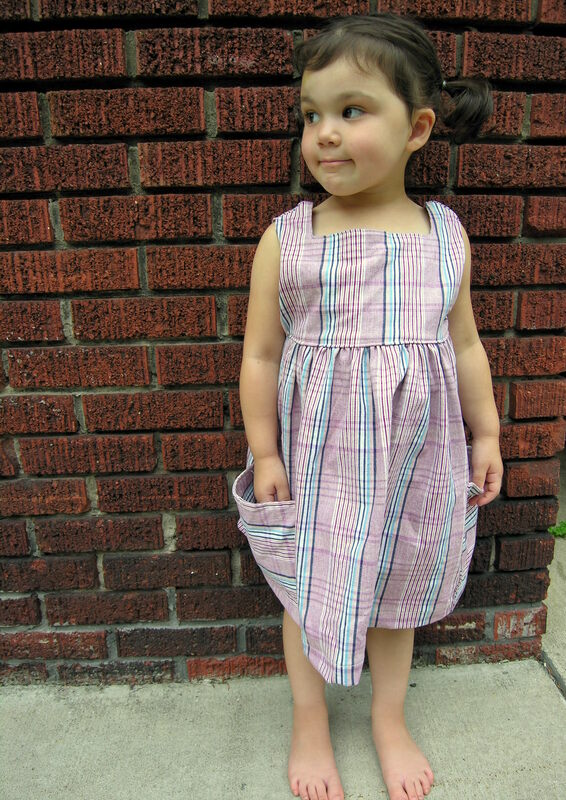 I have been wanting to make this dress for years, so sad I didnt’ purchase the pattern until now. Who can resist a little hedgehog? Especially a hedgehog wearing a scarf? I used a dark chambray from Robert Kaufman (also from Purl) and Michael Miller’s Hedgehog fabric, which can still be purchased here. I opted to leave off the v in the neckline and the pockets, I prefer it without and it is easier! 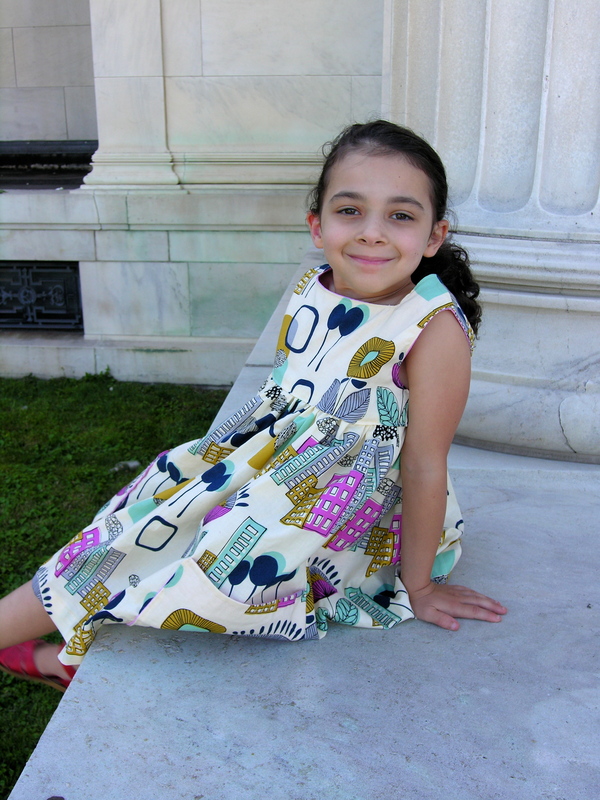 Eleanor loves this dress, and it is going to be hard to make her wait until school to wear it! It will look so sweet with tights and a little sweater when the temps drop as well. I can’t say enough good things about these patterns, and have been sewing up a storm with them. As you can tell from my pictures it is getting harder and harder to get pics of these kids…they certainly don’t want to stand still and are sick of modeling for me- it is hard to take a good picture when you are hula hooping or on a see saw! Can’t blame them though! Part II of this post is coming soon with more, but maybe I will switch to using my dress form as a “model”! 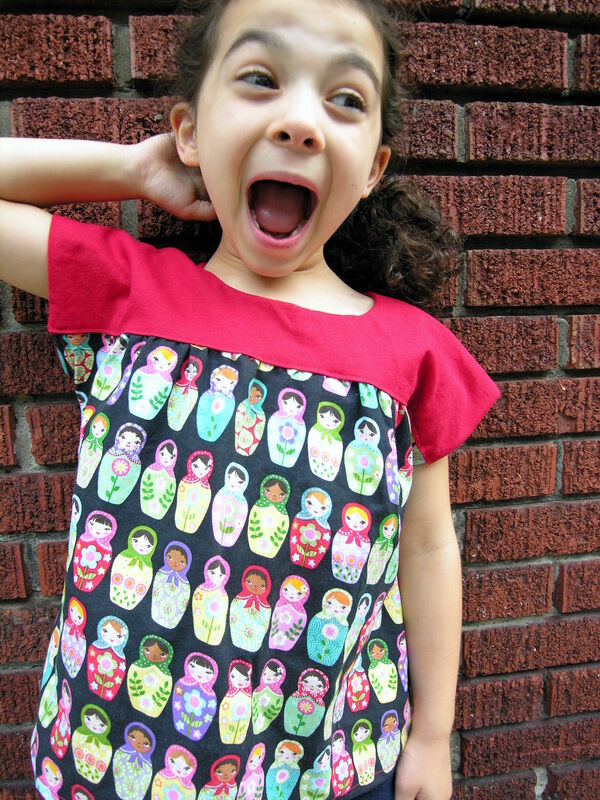 So, when Luvinthemommyhood (one of my favorite blogs- EVER) put out a while back she was looking for pattern testers for her Sally Dress I jumped right on it. 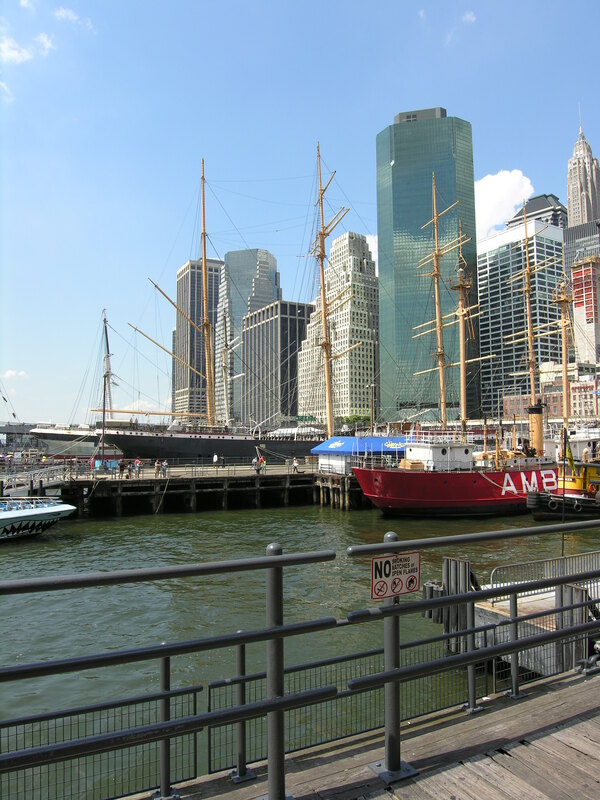 New to the blogosphere I didn’t think I would be chosen, but I was (so excited!) and it was so much fun. I finished these dresses a while ago and have been waiting until the pattern goes live so I could post this! I couldn’t stop at making just one- so I made 4. I am a bit crazy. I made the three of the sleeveless version and one of the elbow length. 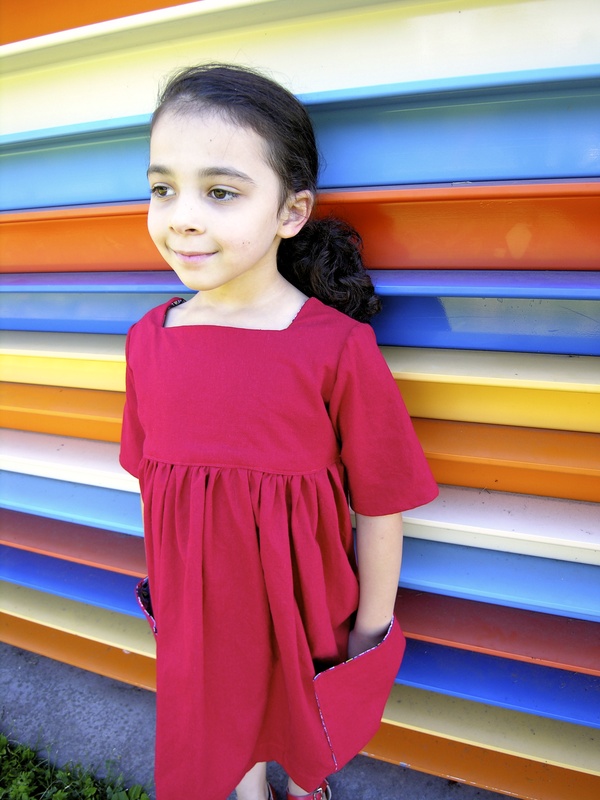 I love them all, but I have to say the red linen is probably my favorite of all I have ever sewn…I am really hoping Isabel agrees to wear it someday. Frustrating that she has refused so far, it is adorable. I took her out on our first fashion shoot outside of our own yard, and headed to the park and Art Gallery to take these shots. 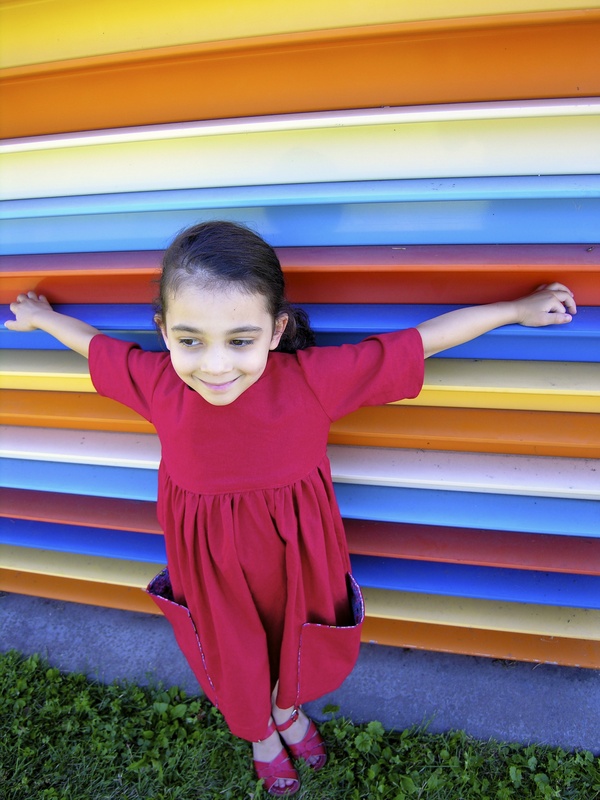 Don’t you love the rainbow stripes- I couldn’t find the artist information online, but it is a huge brightly colored metal cube behind the gallery…a perfect backdrop! I know I will be making more of these dresses. 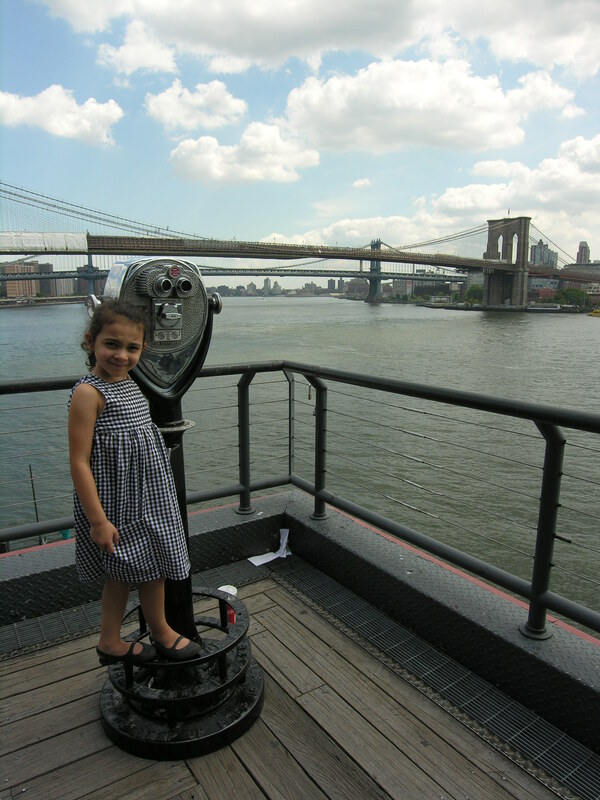 I first tested the size 6 for Isabel. 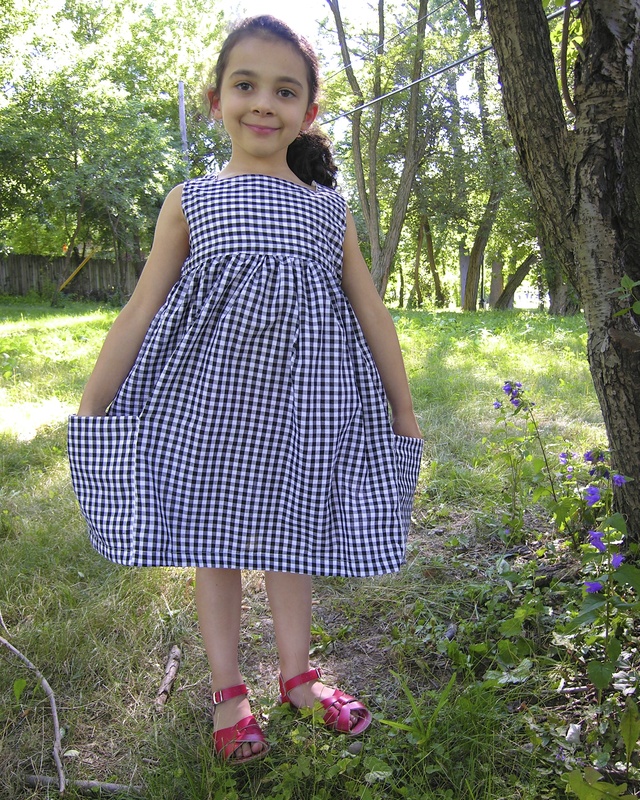 The first dress I made (the gingham) took the most time, I was trying to be perfect and really stick to the directions. I took my job as pattern tester very seriously. ha ha. Once I had it down the others were so easy, and pretty quick. I did take one shortcut on the sleeved dress, I serged the edges of my lining rather than hand sew- I am lazy like that, but on the outside you’d never know it! 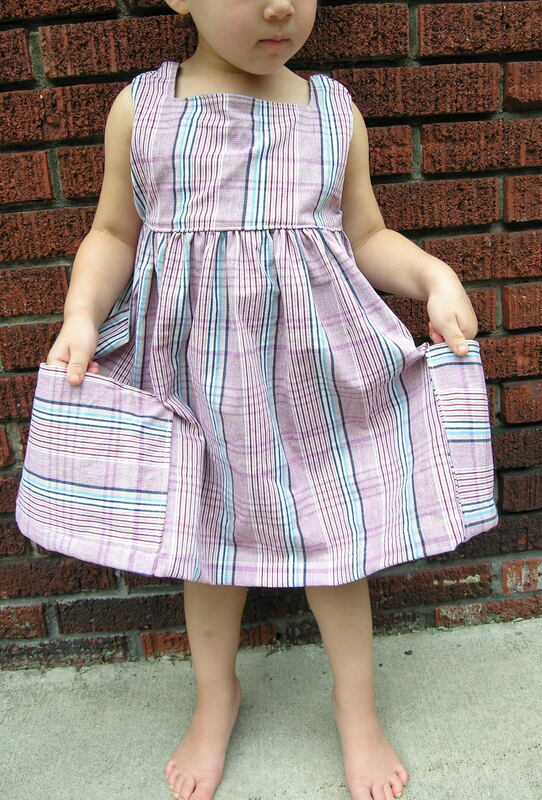 I was also able to test the size 4 pattern and whipped one up for Eleanor- a heavy bottom-weight plaid fabric. I love it as is, but think it will work in the fall as a jumper with a shirt underneath as well. I would recommend this pattern to anyone with little girls, from a beginner sewer on. 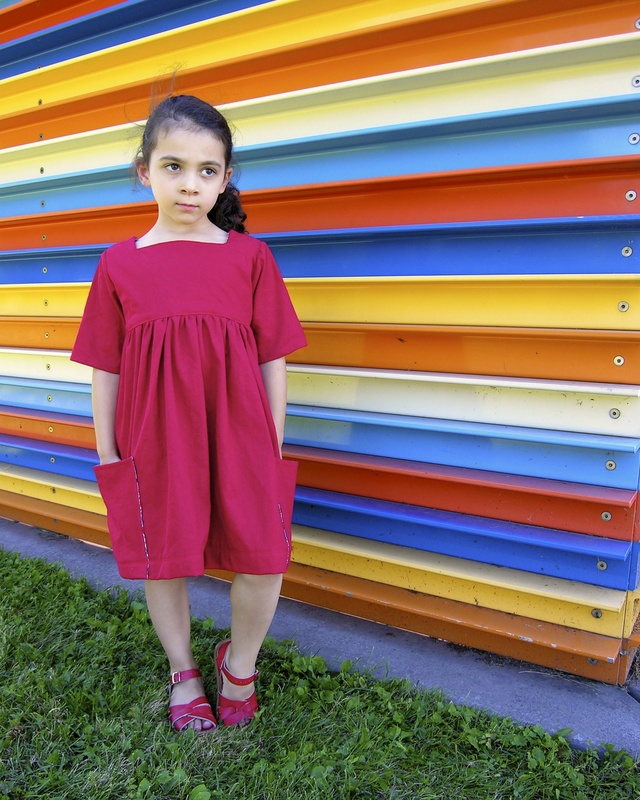 Isabel wore her Mecca Modern dress to an Art Festival and we were stopped MULTIPLE times for people to comment and ask where I got it- and I got to proudly say “I made it!” Such a beautiful, simple, comfortable dress that really shows off your fabric. What more could you ask for? Oh, yeah- I did have a few adults say they would wear it. Maybe an adult pattern should be in the works next? 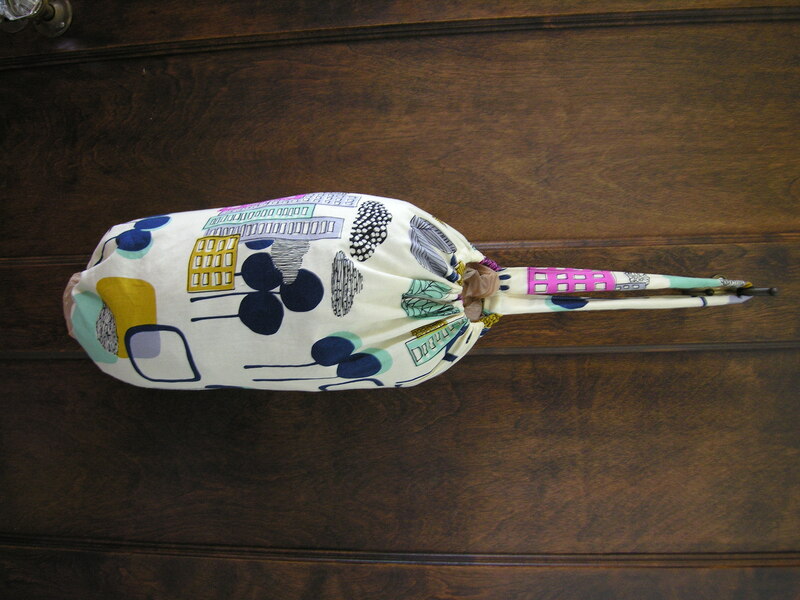 You can find the Sally pattern in Luvinthemommyhood’s shop here or in her etsy shop here. It all started with an amazing find for only $3 at our local Goodwill… a vintage school projector screen. I knew I could do something with it. 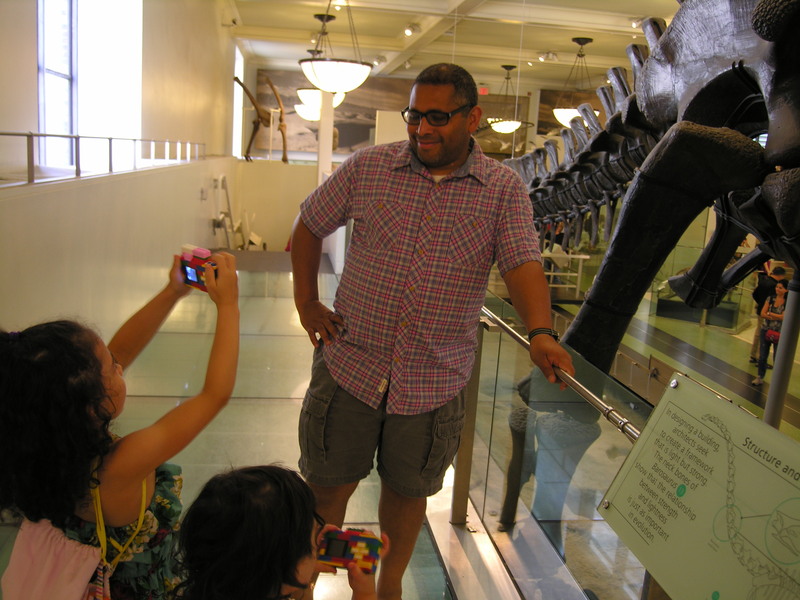 Plus, it had the nostalgia factor going…brought back memories of the overhead projector and dittos at school. Not sure why it reminded me of dittos, but it did. Remember getting hot off the press ditto sheets passed out at school, and every kid would lift them up to smell them? Ahh, memories. My kids have no idea what I am talking about. I am old. Anyways, back to the projector screen find. My husband (on a very rare thrift store appearance) agreed it was cool, so we brought it home and thought immediately of using it for an outdoor movie screen. 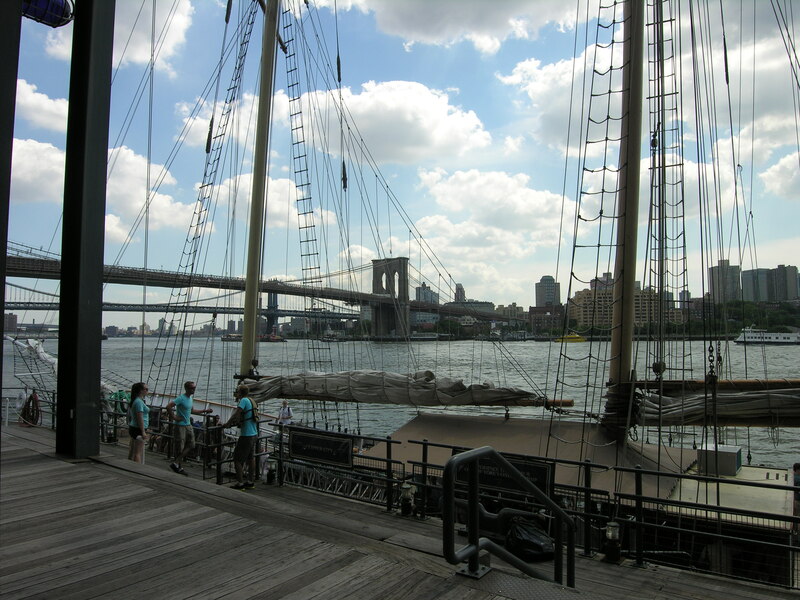 Inspired by sites like this and this, I was determined to plan an outdoor movie night for the girls. Laying out blankets, eating popcorn and sitting under the stars while enjoying a great movie. Like a drive-in without the car or the commute to the theater. 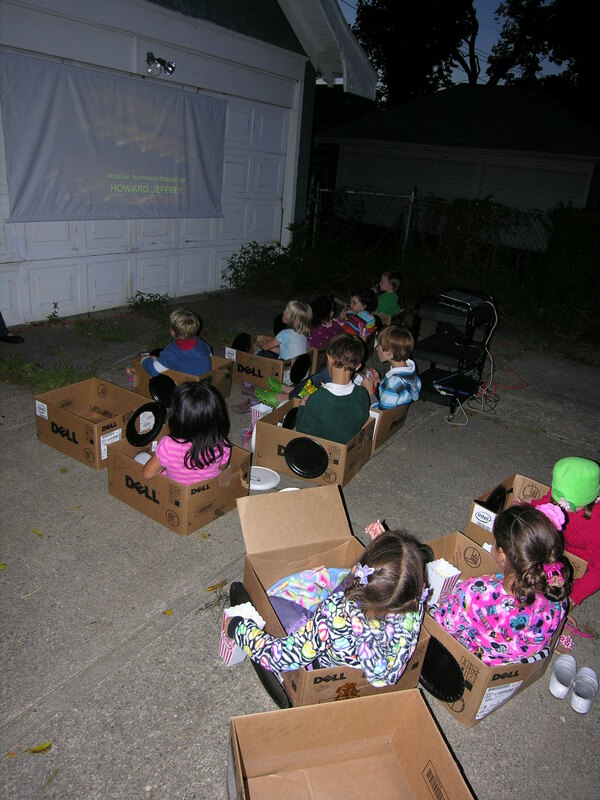 While we are lucky here in Buffalo to still have a Drive-In theater close by (within 30 minutes) you just can’t get any more convenient than your back yard! So, the invitations went out, the movie was chosen (Willy Wonka- the original!) and we did a trial run of the borrowed projector and our vintage screen. BUST. Romanced by the nostalgia, we didn’t really think about aspect ratio, the size of the screen vs. the size of a widescreen modern day movie. Not ready to cancel our party I had to come up with a better idea. 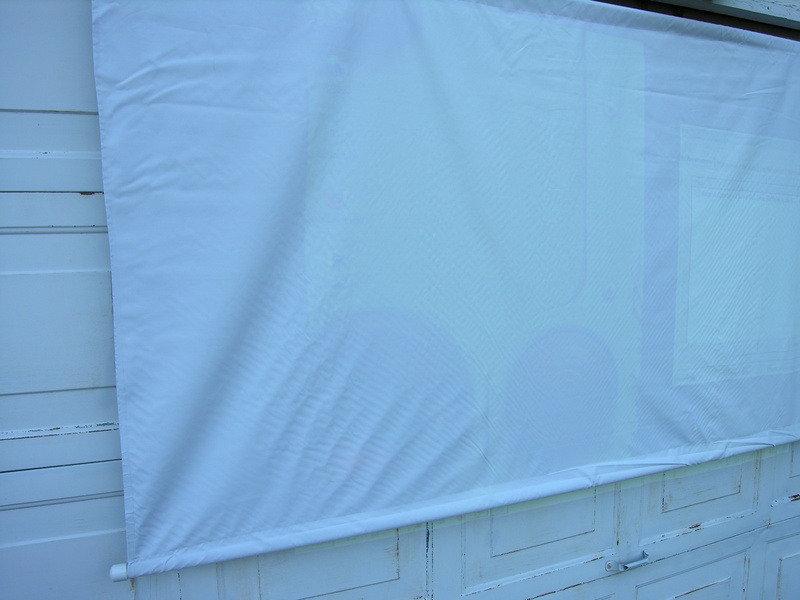 Armed with some spare blackout lining from my latest roman shade sewing project we headed outside to test it out as a movie screen- and it looked pretty good! A trip to Joann’s was in order to buy enough for our screen and I got to work. After some research on aspect ratio (google it- it is a real thing!) we determined our ideal measurement would be to use the width of the blackout lining fabric of 54 inches, and a length of around 96 inches. You can look up aspect ratio here, but we went with a 16:9 ratio. I purchased 3 yards of the lining to make it easy, and cut it down a bit to 100 inches. Measurements do not have to be totally accurate, you just want a good ratio between your height and width. I used PVC pipe to stabilize the top and bottom, using a heavier pole for the bottom to weight it down. Head to your local Home Depot or hardware store and buy a 1/2 inch PVC pipe, and a 3/4 inch PVC pipe. Home Depot will cut it for you for free (at least mine did), so go ahead and have them cut each to 100 inches. The poles cost less than $5 total, and come in 10 ft sections. 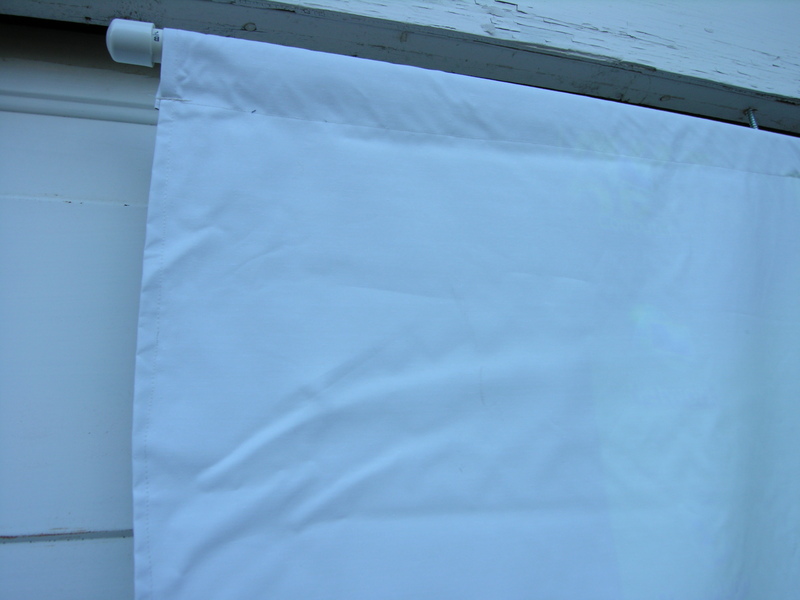 At first I planned to use Duck tape and tape a border around the screen and onto the poles, as I found a few online tutorials doing this with white fabric screens. My instincts told me to sew it, but my husband vetoed that and said- keep it simple…tape it. I agreed and bought some black Duck tape to mimic a real movie screen and got to taping. After the tape sticking to itself a half dozen times, and the girls running in and interrupting, and me messing up again I decided this was far from simple! Yikes. A big mess. Trimming a piece of fabric 100×54 in sticky tape is not an easy job! So, I ignored the tutorials (and my husband) and went up to my sewing room. I broke it down in case you want to make your own! Sorry about the horrible pics- it is really hard to take good pictures at night when you are entertaining a dozen kids (and you are shilling out tons of candy!). The wrinkles that show up weren’t visible during the movie, and had we set this up earlier than 10 minutes before our party we would have spaced our hooks out farther! Live and learn. Also, want to copy the sweet (no pun intended) lollipop balloons? I used the tutorial here as a guide. I skipped the paint and tape and kept it simple (or lazy). 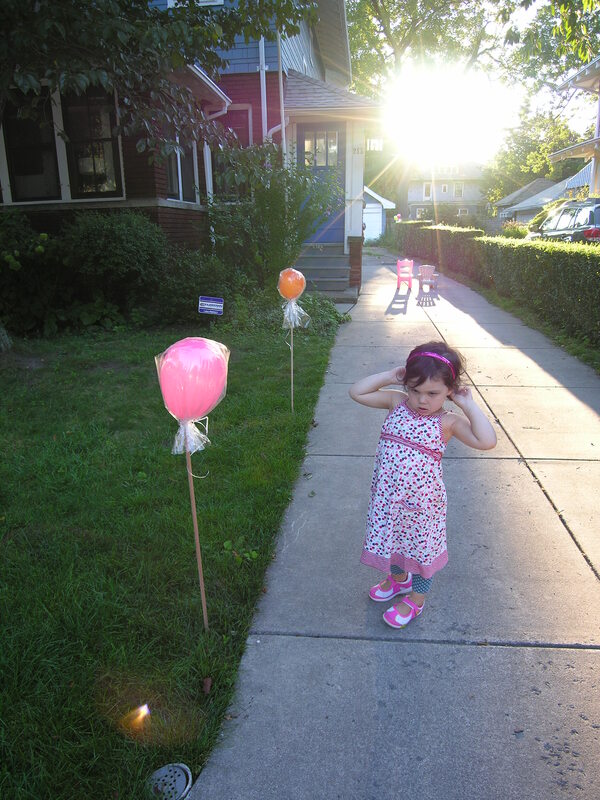 I bought dowels at Joann’s for 1.00 each, blew up a balloon, placed it into a cellophane bag, twisted around the base of the balloon, and tied it onto the dowel and just stuck them in the ground. The balloons and cellophane basket bags (2 in each pack) were from Dollar tree. Super cheap- I made 4 for only $7, but I still have plenty of balloons left and plan on using this idea again- for Halloween ghosts! The kids loved these, the perfect touch for a Willy Wonka movie party! 1. Hem your short edges; the 54 inch width using a 1/2 inch seam allowance. 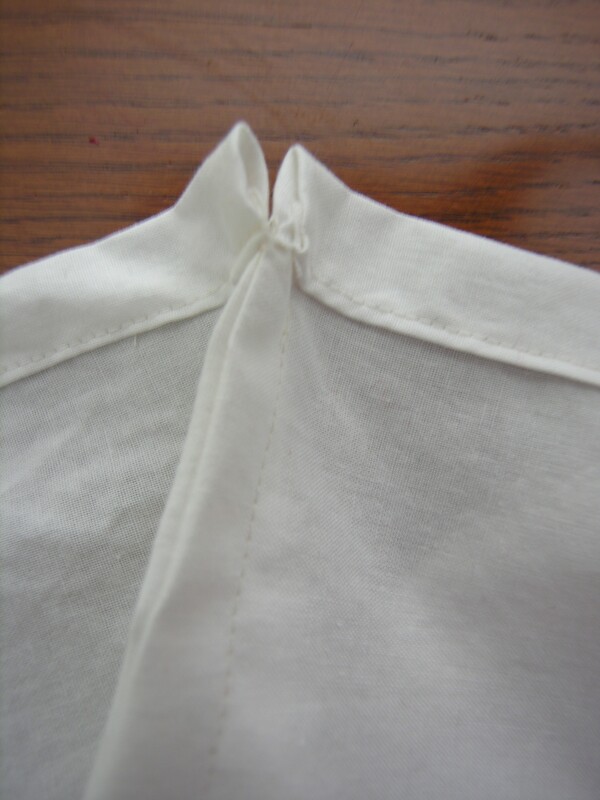 You do not need to double fold the seam, just fold it over once and sew using white thread. This will be a bit difficult to do given the weight and amount of the fabric. Do not force it through your machine, I found it helpful to use my left hand to hold up the weight of the excess fabric and let my feed dogs pull it through the machine. Take your time! Repeat this with the other 54 inch side. 2. Create your “pockets” for your poles. Fold down one side roughly 2 inches and sew. Again, no need to double fold. Adjust if necessary depending on the size of your poles. Repeat on the other side but fold down 3 inches to fit the larger pole. Be sure to backstitch a few times at the beginning and end of each since these will be holding a bit of weight. 3. Insert your PVC pipes into the pockets and pop on your pipe caps (optional). I found them at the end of the PVC aisle, and bought two in each size- 1/2 inch and 3/4 inch for under 40 cents each. These finish off the look of the poles, and help keep the poles from slipping out of their pockets. Your screen is done! 4. Now for the hanging hardware. We chose to hang ours on the front of our garage. My husband screwed in two of these type hooks to the wood trim above our garage door. You could purchase these and just rest the ends of your pipe in the hooks if you have a similar place to hang it, or you could eliminate the pipe caps and slip some rope or string through your pipes and hang from two trees or across a fence or structure. We simply rested ours on the hooks and it worked great. Thanks to the fabric being on sale at Joann’s ($4 a yard!) the total cost of this project came under $20. Can’t beat that! When you are done simply roll it up around one of your polls and store it away until the next time. After the fun we had, there will surely be a next time!! 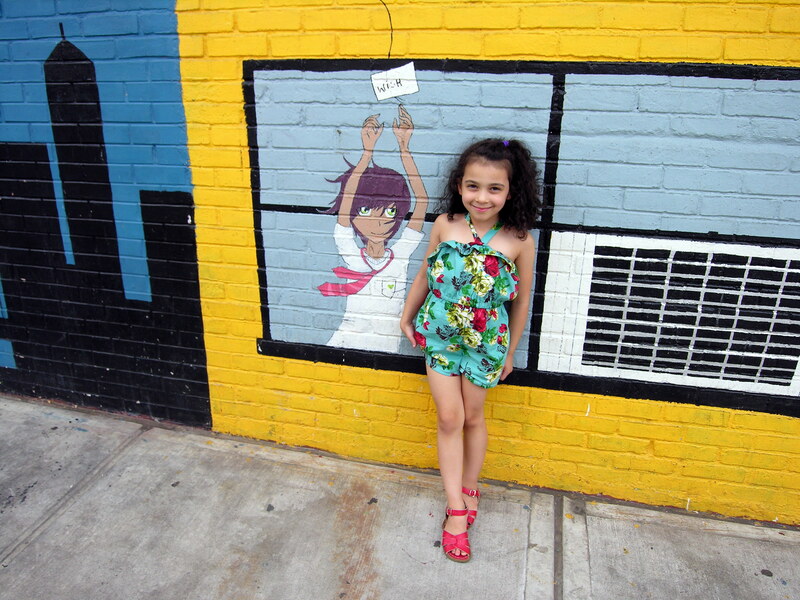 Almost back to school time (and my first Oliver & S) ! Not that I am in any rush for summer to end, but we have ventured into that almost fall/back to school/let’s prepare territory. When you think about it it is really unnecessary in this day and age right? Do we really need to stock up on all sorts of supplies, buy all new school clothes and shoes and backpacks weeks in advance of the first day of school? It is as though stores magically disappear after Labor Day- so we must go shopping NOW! Ha Ha. That is what the commercials and sales ads make it seem- you must rush out and spend $$. Truth is most of us shop for this stuff all year long, just increasing our useless material consumption even more this time of year. My girls drawers are stuffed with clothes, yet I am still determined to buy new outfits for “school”. I’ll blame it on tradition, and ritual. Takes me back to when I was little, and we did buy clothes just once or twice a year…making the trip to Kmart or Hills to buy new jeans or sweaters or imitation designer sneakers. It was exciting, waiting until that first day of school to put on the new outfits or laying them out on our beds trying to coordinate as many outfits as possible out of the handful of new pieces we purchased. 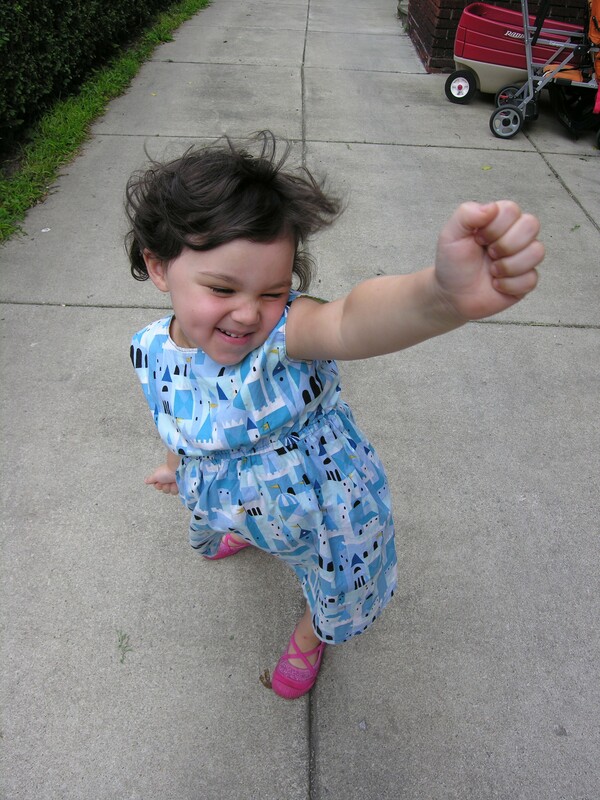 Remember coming home from school and putting on play clothes so that our school clothes didn’t get dirty- do kids even do that anymore? 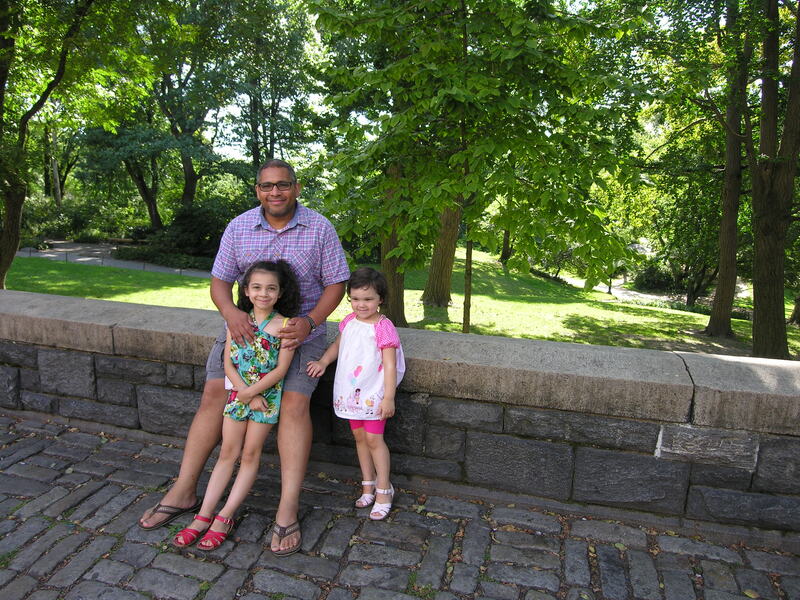 Maybe it is just how I grew up, much different than my girls are now. Anyways, there is something that still excites me about back to school shopping, a new beginning, entry into my favorite season and this year especially since both of my girls are going to be in school! A new chapter for all of us. 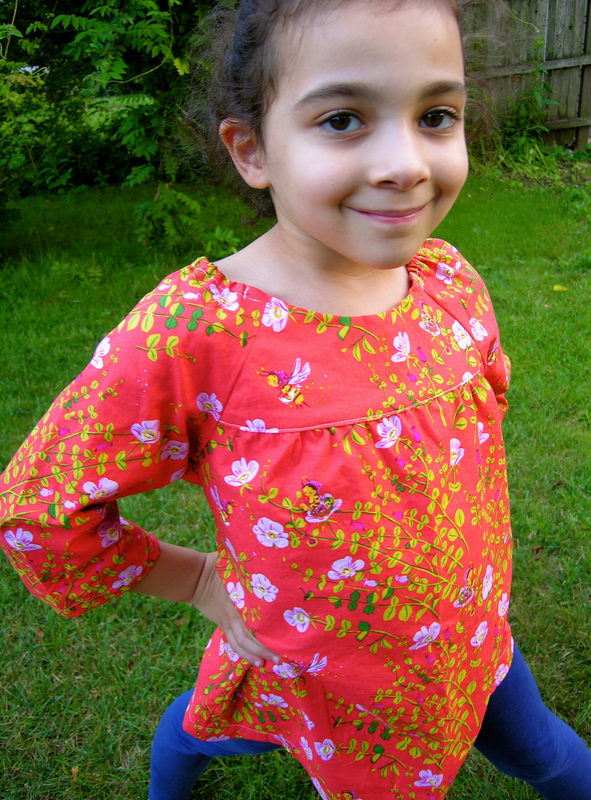 Besides the back to school clothes shopping I am also working on some handmade clothes as well…and I am so excited to have (finally) purchased a few Oliver & S patterns. Why did I wait so long? 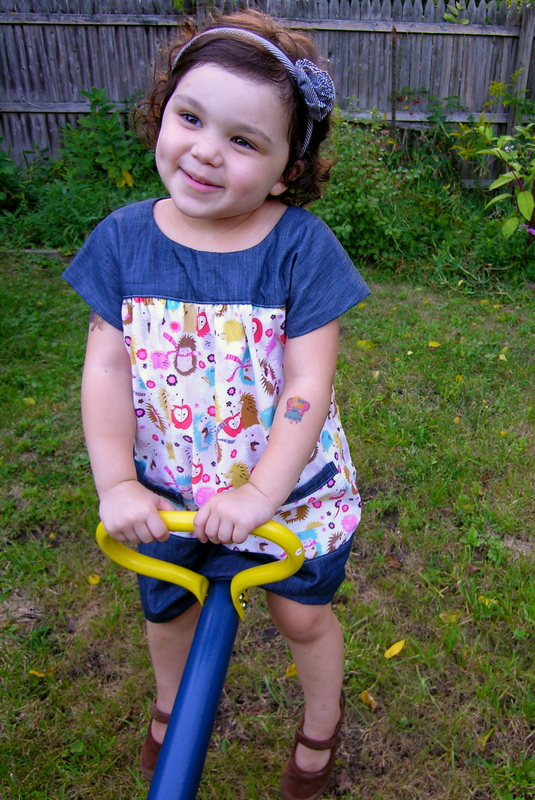 I bought the Ice Cream dress/top pattern and the Class picnic top and shorts patterns. I have been wanting to make the Ice cream dress for years, but now that both of my girls are within one patterns sizes I finally did and whipped up a top version for Isabel. So super simple, although I confess I felt like I skipped through halfof the instructions…all of that basting I totally left out. I love how it turned out even though I cheated! Directions are written out very well, I can see why so many people love these patterns! The dress is so well finished inside, with french seams and a fully lined yoke. 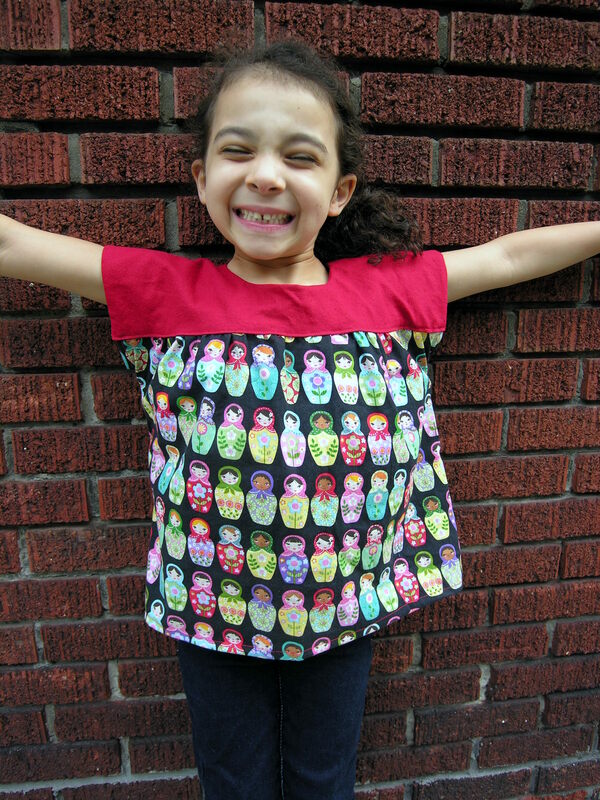 I plan on making a few more for each girl, as well as a few dresses from the pattern as well! 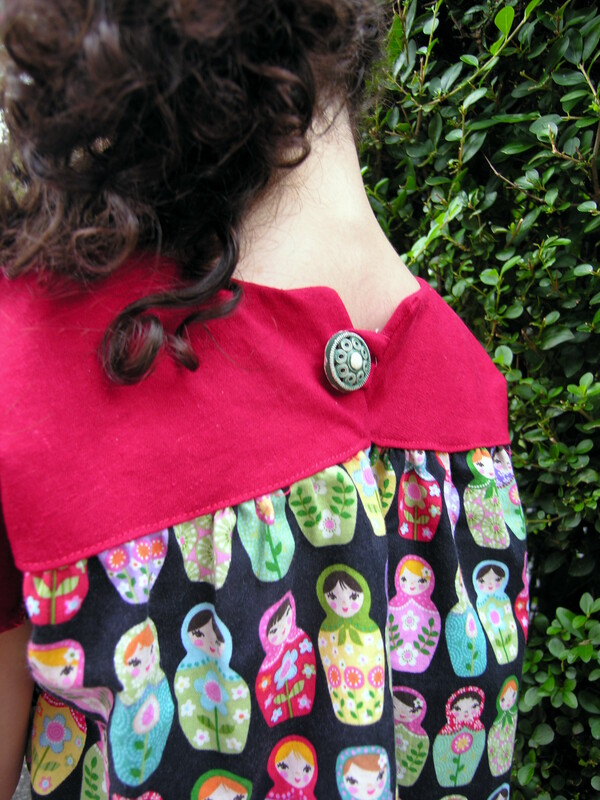 The fabric is a red linen for the yoke, and a black matryoshka doll pattern fabric (from Joann’s). I chose one of my vintage buttons to finish off the back and the result is so sweet. 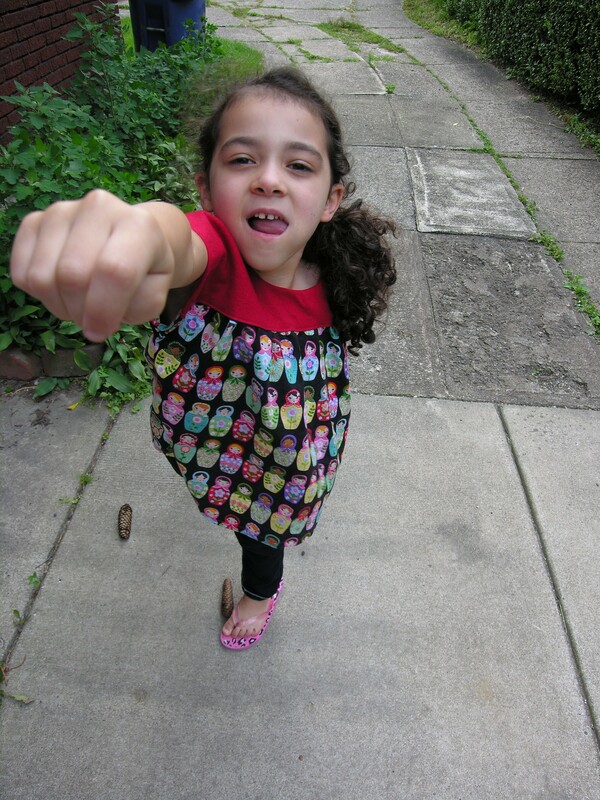 Tired of modeling things for me, the girls decided to have some fun!Super Girls! I am totally taking the easy way out today on this post. I meant to write up my own tutorial on this, with pictures and a beautiful pile of snack bags all set for the upcoming school year. FAIL. 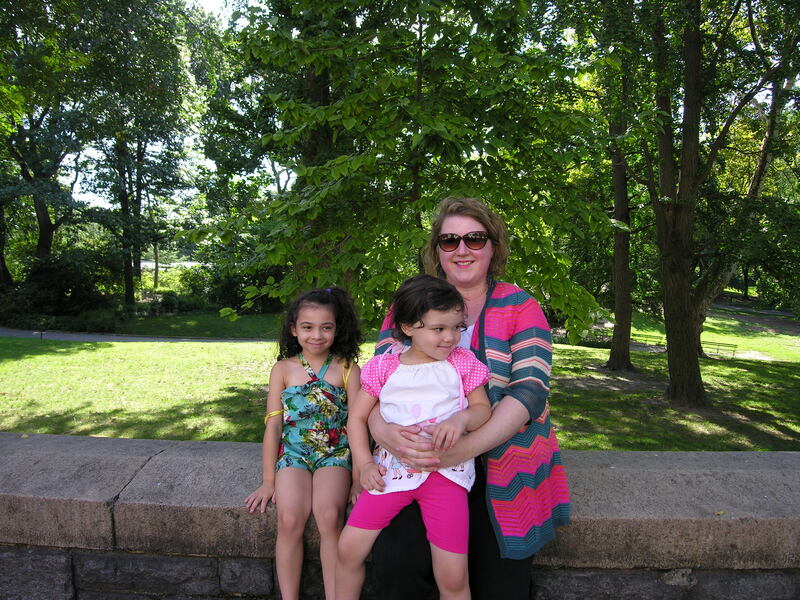 Summer weather returned and I spent some quality time with the girls at the pool and playground instead. And now I am sick. How is it that every time I finally decide to cut myself some slack and slow down I get sick? Hopefully the girls will give me a bit of a break so I can get some rest (doubtful). No time to write up my own tutorial, so here is the tutorial I used when I first decided to whip some of these up a while back. Why recreate the wheel right? Check it out here. 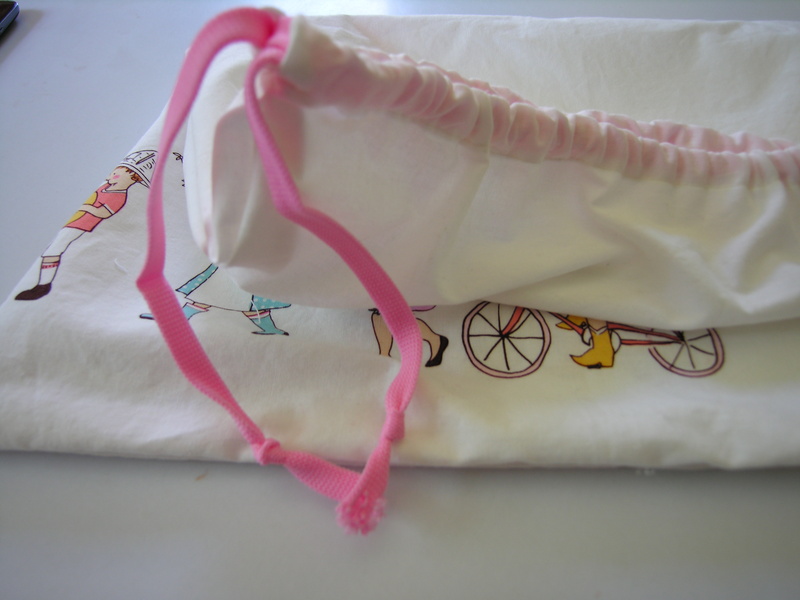 The tutorial uses ripstop nylon to line the bags. This, from all of the research I have done is considered to be foodsafe. 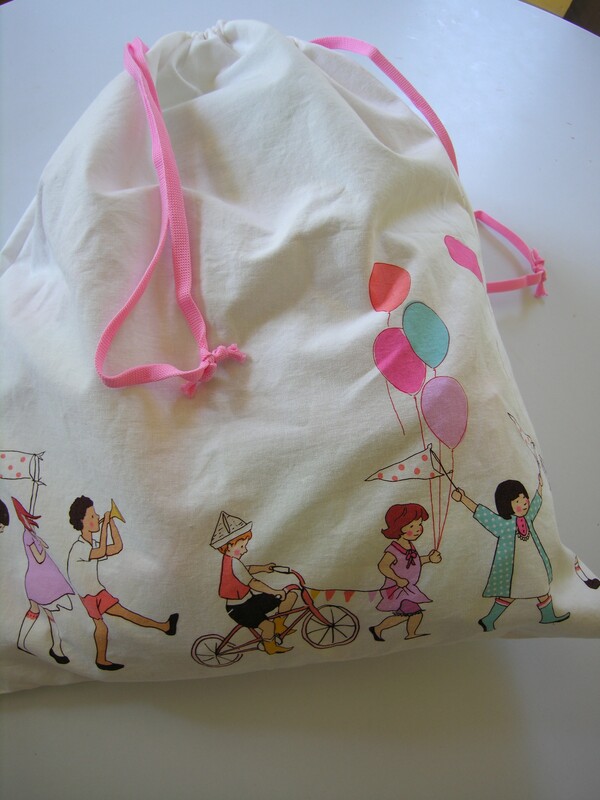 I have made several bags using this tutorial and it is super quick and easy. I decided to go a different route this time, and lined mine in cotton fabric. I have found though that the nylon is not waterproof and does not protect the outer cotton clean from what you have stored inside. Lesson learned after keeping a bag of cheese crackers tucked in my bag for too long- the oils from the crackers soaked through the nylon and discolored the outer fabric layer. Plus, nylon is a bit of a nightmare to sew with. Solution- make the bags entirely out of cotton and do more laundry! I personally feel better about eating out of a cotton bag rather than the ripstop nylon, and they are easily tossed into the washing machine. You can see in the image above I chose to line these in a chambray fabric and I love how they turned out. 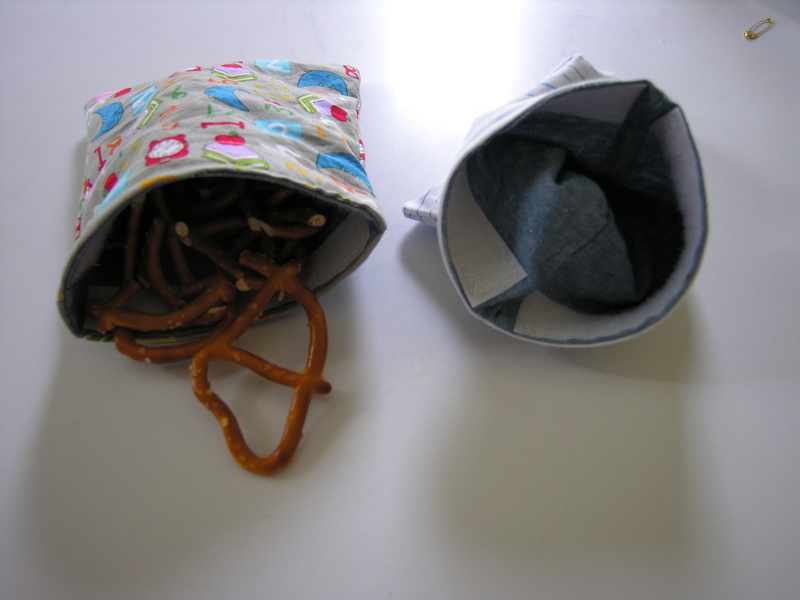 Now I certainly wouldn’t carry around a jelly sandwich in these, what we use them for- pretzels, cheese crackers, cereal and for other dry snacks they work great. I wish I had made these when the girls were babies, they would be perfect for cheerios and those little puff snacks they used to love to eat! The tutorial I linked to above works either way, you can choose to use the nylon or substitute it for a cotton fabric. Super fast and fun to make- and kids love them. Check out the school-themed bags I made for my girls. A special project to personalize that lined-paper fabric is coming soon. 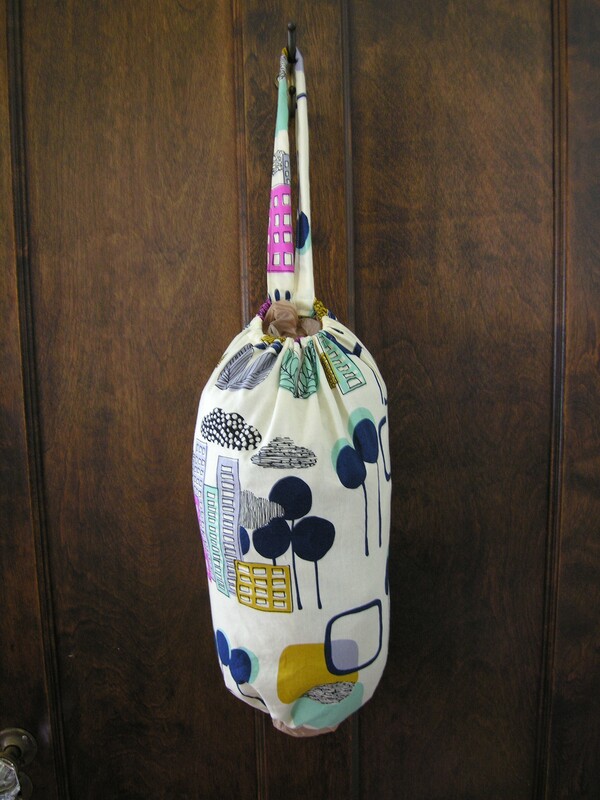 How is it that I have been sewing for over 5 years and I have never made a simple drawstring bag? Until now. I think I have gone a bit crazy over these bags- but I am sure I will find uses for them…toys, knitting supplies, travel etc. I’ve got plans to make several more, let me show you the basic directions on how to make one! Turn inside out and sew around the sides and bottom again (still keeping 2 inches from top), but with 1/2 inch seam allowance. Fold over 1/4 inch on each side (where you left your 1 1/2 inches open) and press. Fold top down 1/4 inch and press, and again 1/2 inch down and sew your seam across. This creates your casing for your drawstring. Attache a safety pin to your cord or ribbon and pull it through the drawstring channel on one side of the bag and then back around the other side so that you have both ends of the ribbon on one side. Repeat on the opposite side with the other cord or ribbon. Knot your ends together and cut off excess. Fill ’em up with your stuff and you are done! Nothing says summer like packing a picnic lunch and heading to the park or playground. There is something about loading up the picnic basket, blanket and snacks that makes eating lunch outside extra special. 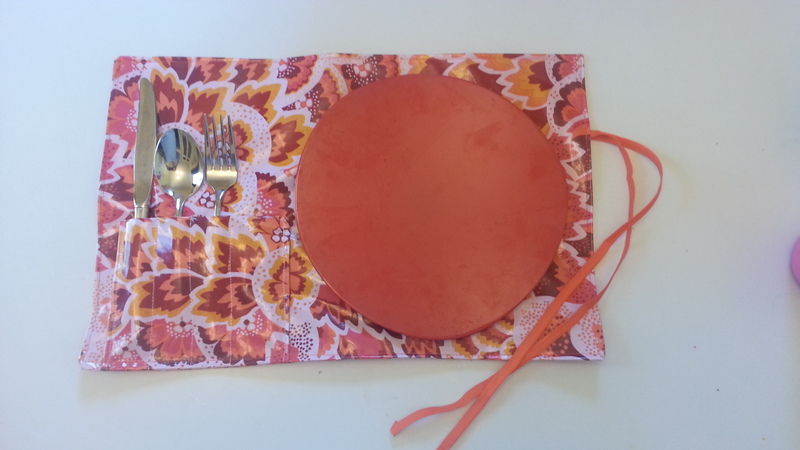 To avoid the inevitable crumbs, spills and “oops” on your picnic blanket (or having your kids eat directly off of the dirty picnic table-yuck) you can whip up these simple, wipeable placemats. I used a beautiful laminated cotton (Amy Butler- rose, peacock feathers) so there are no worries about stains- just wipe them clean and reuse. The pocket is perfect for sliding in your cutlery, and the ribbon lets you just roll them up and store them away. Great to carry around in your purse or diaper bag too- so you’ll always have a clean surface for you or your little one to eat on (with or without a plate!). Fold your pocket piece right sides together and sew side seams (to form a 5×5 inch square) leave bottom unsewn and turn right sides out. Place on top of one placemat piece, one inch from the left botton corner. Sew sides onto your placemat and sew lines to form slots for cutlery (roughly one inch apart) You should now have a double thickness pocket with 4 slots for cutlery. Your bottom edge is still unsewn. Fold your ribbon in half and baste to center of right side edge. This will form your ties. Place one placemat piece on top with right sides facing. Take your time, do not pin or you will leave holes in your laminated fabric. Sew around the perimeter leaving at least 2 inches open to allow you to turn it right side out. Be sure to backstitch at the beginning and end. Be sure your ribbon is tucked inside. Turn right side out. Topstitch all around your placemat, closing up your opening. Repeat for other placemats and you are done! 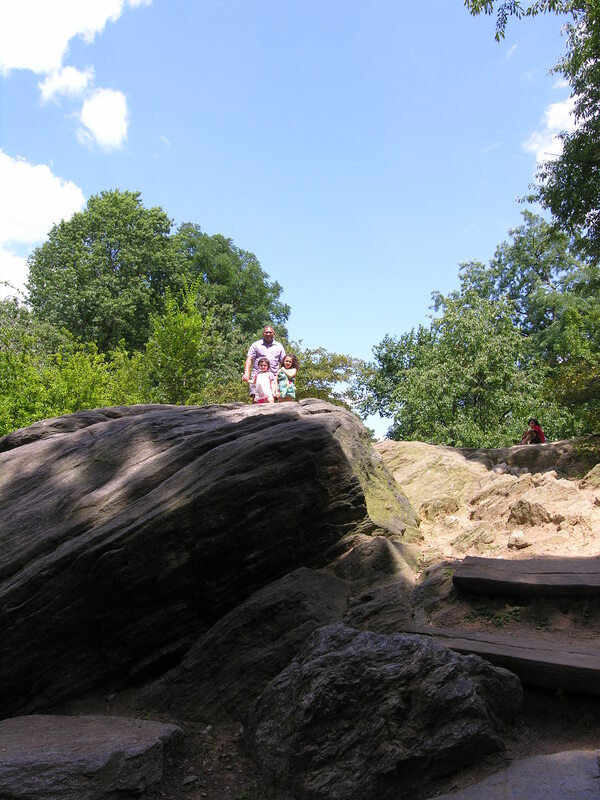 Now pack a lunch and get outside before Summer is over! 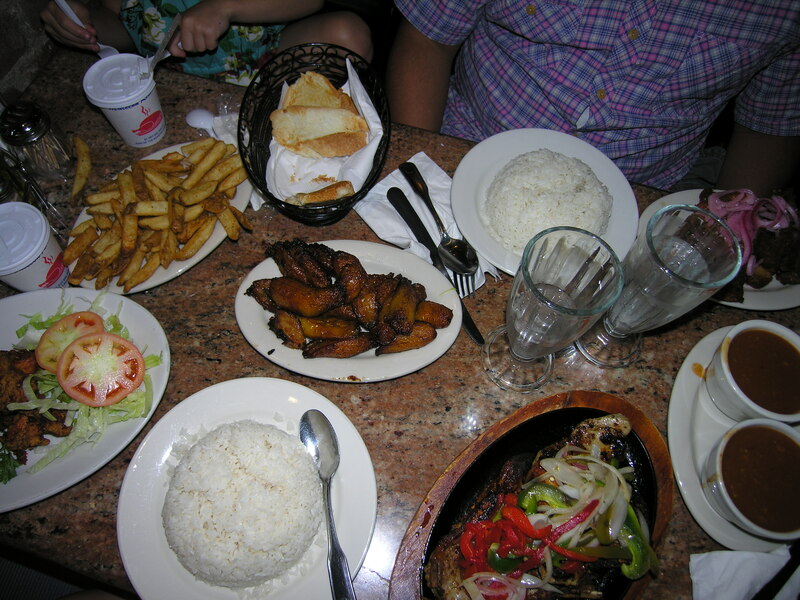 Can be completed in under 30 minutes. Fit under the umbrella of going “green”. Good for you, good for the environment, good on your budget. I am so excited to get started. 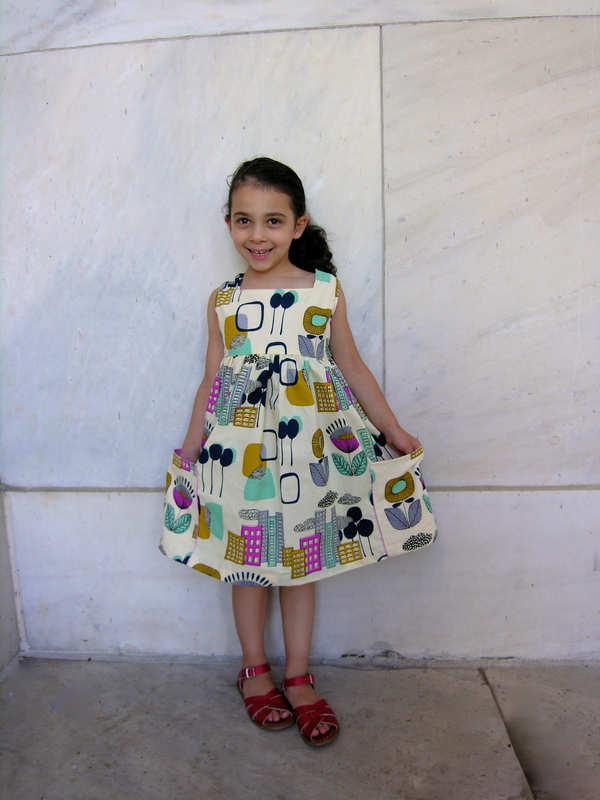 Hopefully at least one of the projects this week will inspire you to get sewing! For more details on this series see last week’s post here. Our local grocery store sells and encourages the use of reusable bags. I have purchased over a dozen of these reusable bags over the years- but they always seem to get “lost”. Lost in the trunk of the car, used for swim class or taken to the library, soccer stuff etc. Or, simply forgotten in the trunk of the car in the grocery store parking lot! In other words, I often forget to bring them in or can’t find them and kick myself when I walk out of the store with an endless supply of plastic shopping bags. I hate throwing them out- it feels so wasteful when they can be saved and used again. Unfortunately they are not the most attractive looking and can get a bit out of hand- they seem to multiply on their own! Not the most attractive thing hanging in the kitchen. Here comes the Bag Holder. A great excuse to introduce an awesome fabric into your kitchen and corral those ugly plastic bags. This is extremely simple and fast to make. Plus, it looks a bit better hanging in my kitchen! You can really make these any dimensions you like, my measurements are just an example. This is a great way to use up fabric scraps, I actually used the dimensions of my scraps to determine how large I made mine. 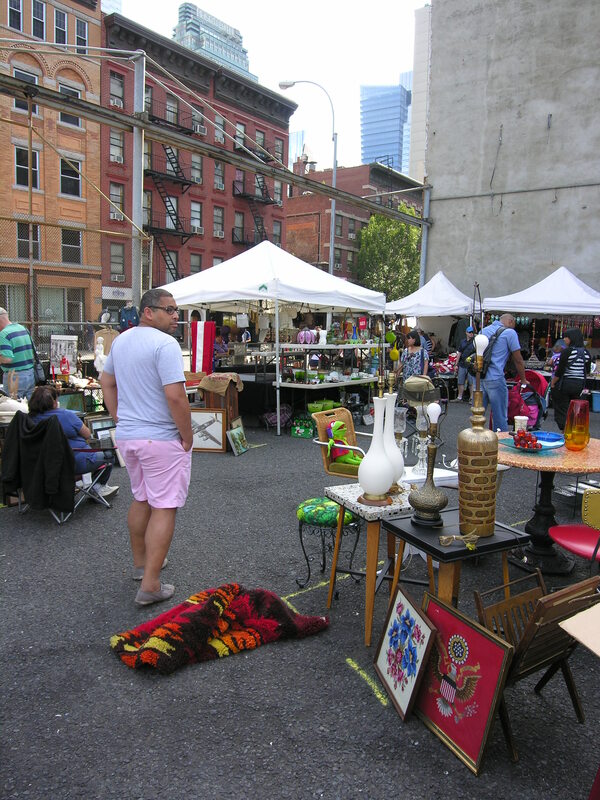 Fabric is Alexander Henry Mecca for Moderns- Mercer. 2. Sew your seam, and finish your edges. (I chose to use a 1/2 inch seam allowance and pinking shears) If you use one piece of fabric you sew the long edges together to form your back seam. 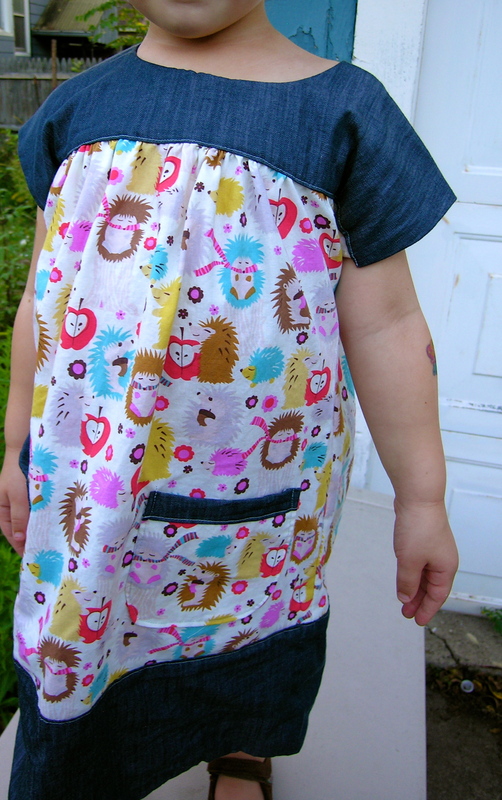 If you use two pieces like I did, sew up the long sides to form side seams. 3. Create your casings by folding over the edges 1/4 inch, and again at least 1/4 inch (room enough for your elastic). Press if necessary, although I just wing it and finger press as I sew. Sew the casings at the top and bottom of your fabric, leaving 1/2 inch space unsewed to insert your elastic, be sure to backstitch at the beginning and the end. 4. Cut your elastic in half. Use a safety pin to insert your elastic through the casing, sew the ends of the elastic together and sew up your openings. 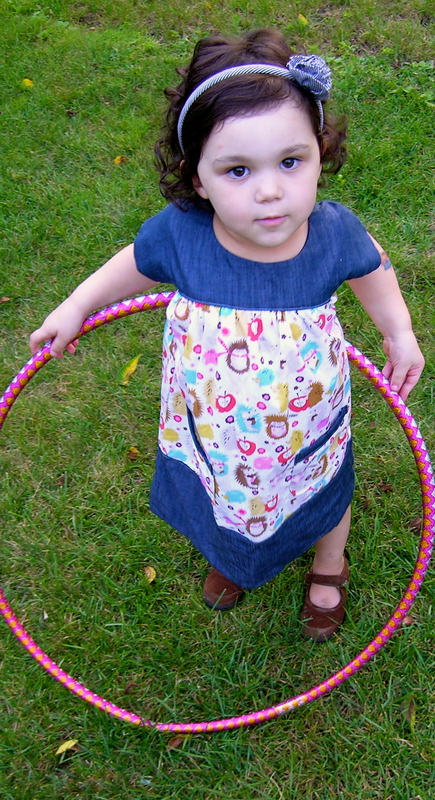 You could also choose to use cotton webbing, or ribbon or a coordinating fabric. Depending on where you will be hanging your bag you may choose to use a shorter or longer loop. Adjust as necessary, my door hook is pretty high so I chose to have a longer loop. 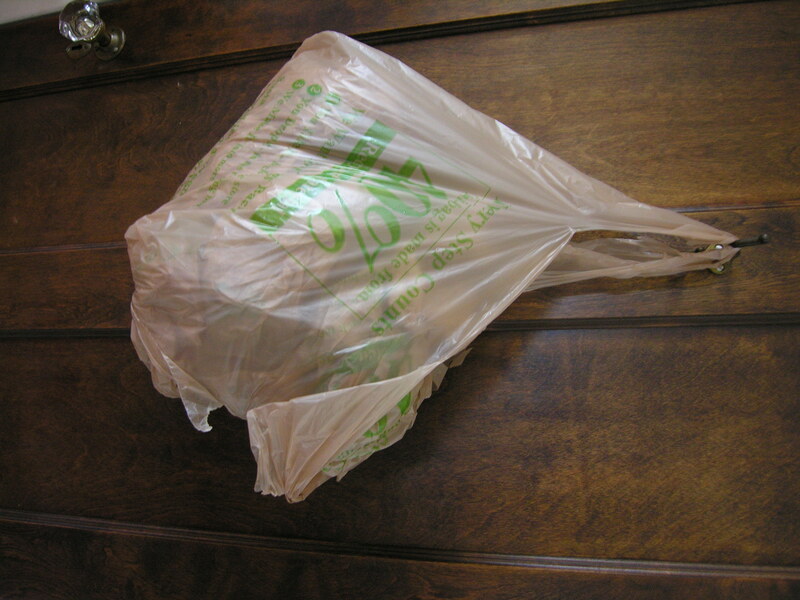 Now, stuff your plastic bags in one at a time through the top. When you need one simply pull one out through the bottom- so easy! I know these aren’t the clearest directions, but hopefully it makes sense…I will be sure to take pictures during the process next time. 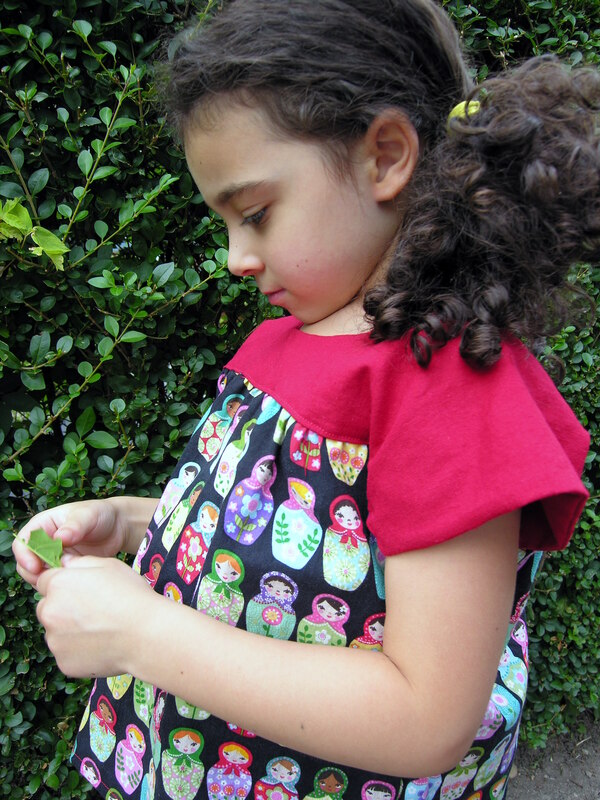 Simple Summer Sewing Series- Going Green! How is it August already? 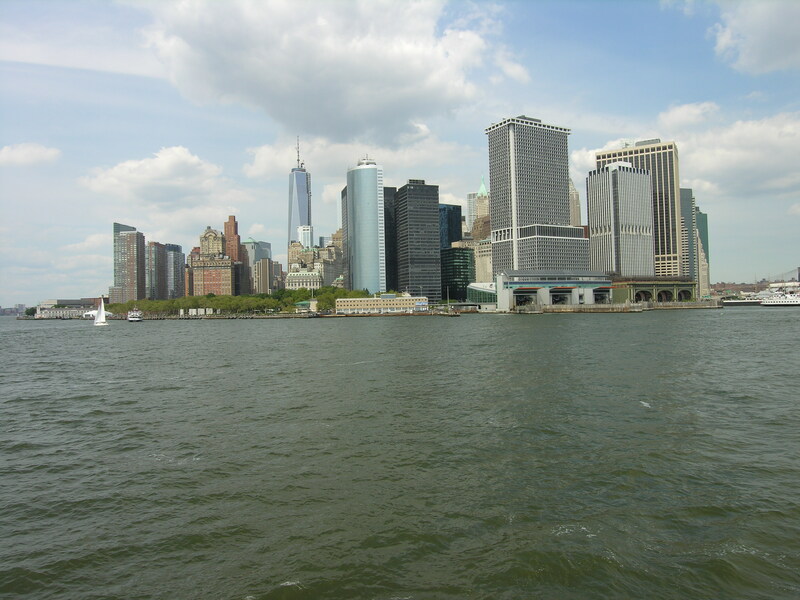 This summer is flying by…where is the time going? I don’t know about you, but my summer schedule is packed! 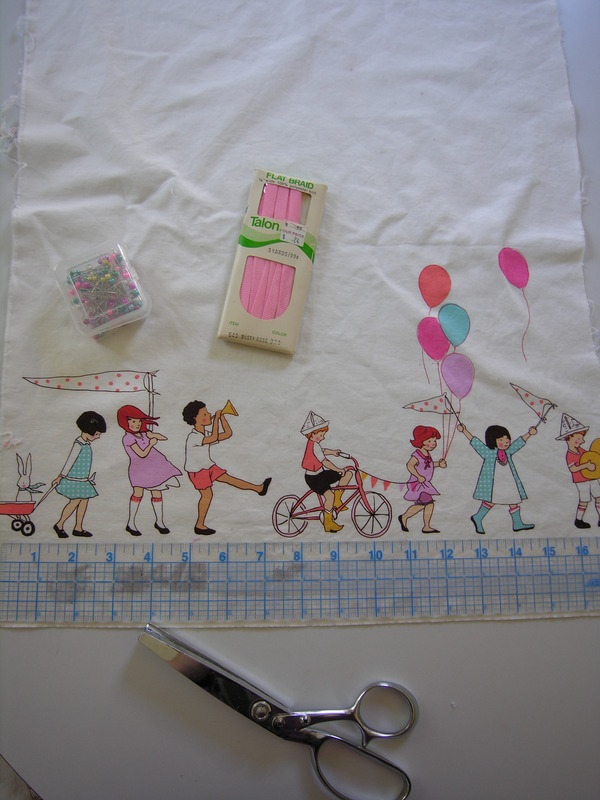 With the longer days, warmer weather and two little girls to entertain I am not left with much time to myself…let alone sewing time. By the time the kids are in bed (sometimes after 9pm!) I am too wiped to sit down and start a project. I can only spend so much time in front of my sewing machine while the girls run around the house screaming at each other. Yikes. Don’t get me wrong, I still sew almost every day but I have to be mindful of how long each project takes…enter- the Simple Summer Sewing Series. Say that twice fast. Almost as hard as She sells seashells by the seashore. I am so corny. Anyways, I am pretty excited about the projects I am going to show this week; 5 easy and QUICK projects perfect for the beginner sewer or anyone looking for a simple project. Best part- totally doable in less than an hour (sometimes less than 30 minutes! ), so you will never feel guilty staying indoors on a beautiful day locked up in your craft room. Yay! Pretty awesome if I do say so myself. I hope this will become a recurring series, this first one focused on being GREEN; simple projects to satisfy your creative urges and produce something useful and eco-friendly at the same time! Day 1: Bag holder- a pretty disguise and holder for all of those ugly plastic bags you save/recycle. 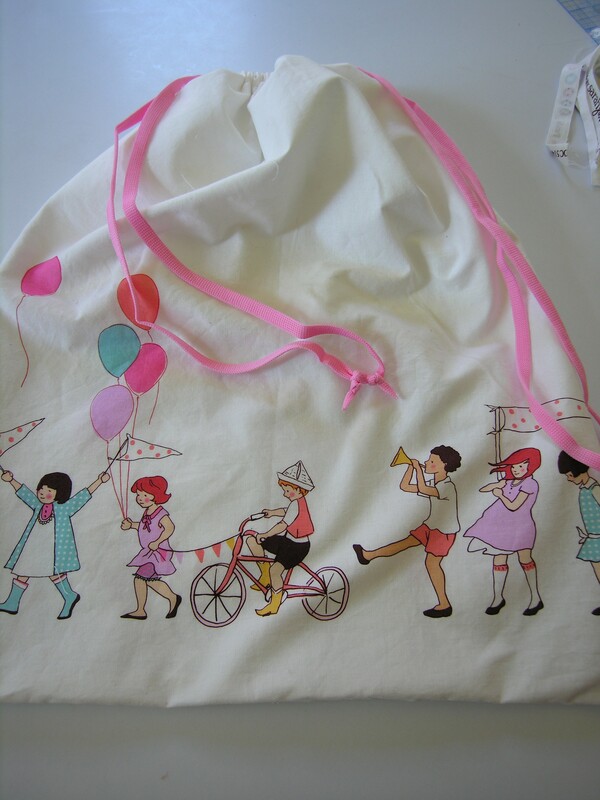 Day 3: Drawstring bags- self explanatory- fill ’em up with toys, use them for your knitting, etc. 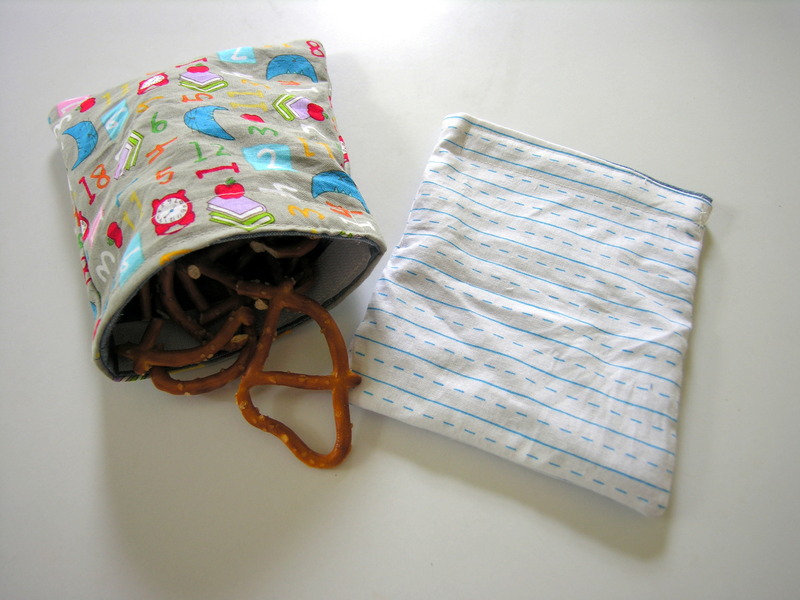 Day 4: Reusable snack bags- never (well, in an ideal world) buy another plastic sandwich bag again. Fill them up, eat your snacks, wipe them clean and repeat. 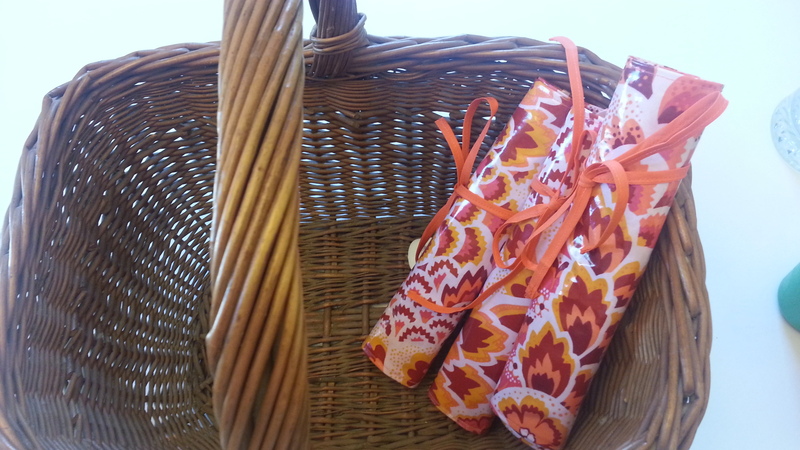 Day 5: Cloth napkins- go green and add something pretty to your lunchbag at the same time. So please stop by Monday and check out what I’ve got in store for you. I can’t wait to get started…already thinking of the fabric for each project. That’s the best part isn’t it? Here’s a little preview of day 1! Gotta throw in at least one picture right?